The Essentials of Law, Ethics and Professional Issues for CAM by Zetler and Bonello. Julie Zetler in addition to a law degree has done a masters in Bioethics and is a senior lecturer at Macquarie University whilst Rodney Bonello is associate Professor at the Department of Health and Chiropractic at Macquarie University. They have compiled their resources to bring us quite a useful book which is technically divided into two parts. The first part discussing the foundation principles in law, business and ethics and the second part of the book goes into detail of the specific CAM therapies themselves. The CAM modalities discussed are chiropractic, osteopathy, herbal medicine, naturopathy, traditional Chinese medicine, acupuncture, massage and homeopathy. Being a TCM practitioner and soon to be, a registered TCM practitioner in Australia, chapter 12 on TCM was of most interest to me. I am presuming that Sarah George, one of the acknowledged contributors, was forthcoming with most of the information about Chinese herbal medicine and acupuncture. She is a current Australian Acupuncture and Chinese Medicine Association member and has given the authors concise information about the in and outs of TCM. Zhen Zheng actually has written the chapter on TCM, who is a lecturer at RMIT. One interesting statistic revealed in this chapter that I came across was that in 1998, 75% of general practitioners had referred patients to acupuncture. In all, the chapter is very thorough with lists of the Universities that offer TCM and the types of degree available. Some of the Ethical Concerns they brought up were discussed in the registration section. In particular, using testimonials in advertising, as the registration act clearly states that one should not. This issue has been a bone of contention here in New Zealand with the New Zealand Register of Acupuncturists Inc clearly outlining in the NZRA guidelines and ethics that one can’t use testimonials in any form of advertising, Yet I estimate at least a third of NZRA members use testimonials in their advertising. This is one aspect of registration that I look forward to when it will be officially banned. The other ethical consideration is the practitioner calling themselves a Doctor or Specialist. Personally I feel that practitioners, who have studied TCM, should know their own capabilities and skills and believe in their healing modality and accept who they are. Why do they need to “pretend” to be a doctor as well? Over servicing is another paragraph in the chapter on TCM and is worth mentioning. Zetler and Bonello give us the figures that a minimum of 6 sessions of acupuncture is to give the patient a fair chance of testing its effect. For some chronic conditions, 20 sessions may be required. And in modern clinical trials, 8-20 sessions of acupuncture are common. I don’t agree that putting figures like this is a book of this nature is of benefit to the community or TCM profession. They quote “Over servicing is identified by third-party insurers”. Third party insurers are fundamentally in a business to make a profit from their financially contributing members and if more profit means paying for fewer treatments, then that is what they do. The reason modern clinical trials only do 8-20 sessions, is because the Universities only have limited funds to conduct the trial in the first place and can only afford trials with limited number of treatments. So then it appears that if acupuncturists are asking their patients to come more than 8 times, they are over servicing. And the code of ethics also reminds practitioners of the vulnerability of patients !! In New Zealand with the Accident Compensation Corporation, ACC, we have seen the government controlled insurance company gradually; keep cutting back the money that is being paid out. Just over 10 years ago, a patient used to be able to get up to 48 treatments for an infraspinatous sprain or tear. Now they get 20 treatments. Now after having attending the various ACC seminars, if reading between the lines, they basically want acupuncturists to see the patient for less time and hence charge out less. To get the point across, they don’t mind if we see the patient for a longer session, but they want us to charge out less. I know for me, the best results that I have obtained have been with patients that who have had more than 20 treatments. One thing is certain, results such as re-growth in the spinal disk, significant reduction of osteo-arthritic status and correction in kyphosis and so forth, won’t be achieved with 8 treatments. 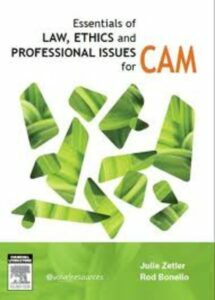 Each of the separate CAM modalities, as discussed in their individual chapters, have a general theme to them and include discussion on history, recognition and status of the profession in law, health funds, professional associations, education, how it works, scope of practice, safety, ethics and record keeping. There is a chapter on research and discusses the different type of research that the universities are partaking in. It enlightens one to the randomized clinical trial, case control and cohort studies and quantitative verses qualitative research. The ethics considered when undertaking and applying for research is explained. I know in New Zealand, where TCM research lags considerably behind Australia, it is largely due to the Ethics department in Dunedin rejecting most TCM research applications. I expect situations like this will gradually change as New Zealand heads for its own TCM registration and we have more students graduating with a Bachelor and hopefully later obtaining master degrees. In the final analysis, would I suggest that you run out and buy this book. It would depend who you are. Certainly a copy should be in any TCM college library and this copy from Elsevier will be forwarded to the New Zealand College of Acupuncture and TCM. That college has just started its bachelor program and I am certain students will get a lot of this book even though it is focused on the Australian setting. The book is symbolic of the changing nature of the acupuncture and TCM profession. Thirty years ago the best book on acupuncture available was the Outline of Acupuncture and they didn’t even teach ethics at college. One of my lecturers actually married his student. And just for the record, he is still married to her. So much for ethics!